Ohio State Buckeyes Decanter and Drinking Glasses Set. These beautiful hand-crafted crystal decanter with four drinking glasses is designed with the highest-quality glass, right here in the U.S.A. The whiskey decanter has a Buckeyes pewter logo emblem on the front as well as on the bottle stopper. The decanter holds 24 ounces of your favorite liquor. 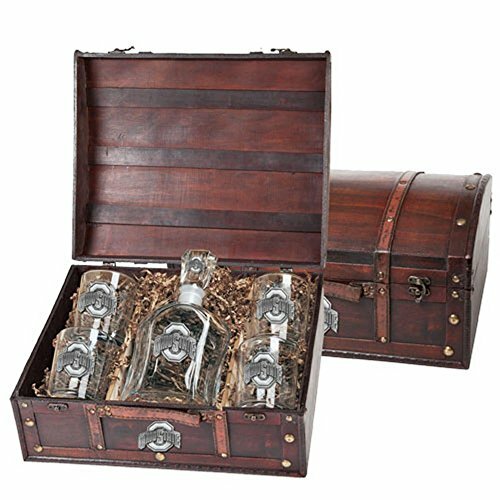 The set of four glasses and the beautifully designed display chest also feature the Ohio State pewter logo. Raise your glasses and toast Ohio State with all of your friends! This capital decanter set will be the topic of conversation at your bar. It also makes a fantastic gift for that true Buckeyes sports fan! Go Buckeyes!! If you have any questions about this product by Heritage Metalwork, contact us by completing and submitting the form below. If you are looking for a specif part number, please include it with your message.